I went to sleep to the sound of the Deer moaning in the distance, it was pretty cold and I was prepared for a very cold night. I woke up at 4 and lay awake until 5 when I finally decided to get up and have a wee, it wasn’t as cold as I thought it might be but we were in a cloud so it was pretty wet. I went back to sleep but I was glad when my alarm went off because I was having some crazy dreams. I shouted out to the others that I was having difficulty getting out of my sleeping bag and that my tent was wet with condensation. I hear a tent zip and then Sandy said ‘it’s not that bad’. And she was right. It wasn’t that bad. We packed up and Crusher and I left before Sandy and Colin who were still in their tent, they move faster than we do so can afford a later start. We had a small climb up to Bald Hill through the forest, which was starting to get a bit muddy in places. Some bush bashing avoided some of the worst bits but my shoes were pretty muddy by the end, Crusher sunk in up to her knee at one point. I laughed. She wasn’t too impressed! The trail opened out into tussock where it was still muddy and boggy. At the top of the hill was a huge mobile phone tower which was pretty ugly, and a large, noisy, smelly generator powering it. But it was here we got our first views of Bluff, well we could see down to Riverton and Bluff was covered in cloud, but it was out there. We joined a dirt road for a couple of miles, collected some nice fresh water which was flowing out the side of the hill and sat and had a snack at the bottom before the next climb. It was a short but steep climb through Longwood forest which got really muddy. Colin overtook me, I don’t know how he moves so fast trough the mud and manages to keep his feet clean! After some acrobatics to avoid walking in the mud I took a wrong step and sunk in up to my knees. Both legs. It was difficult to get out of the mud but made it out eventually, covered in cold, wet and stinky mud. At least now I didn’t need to be so careful. 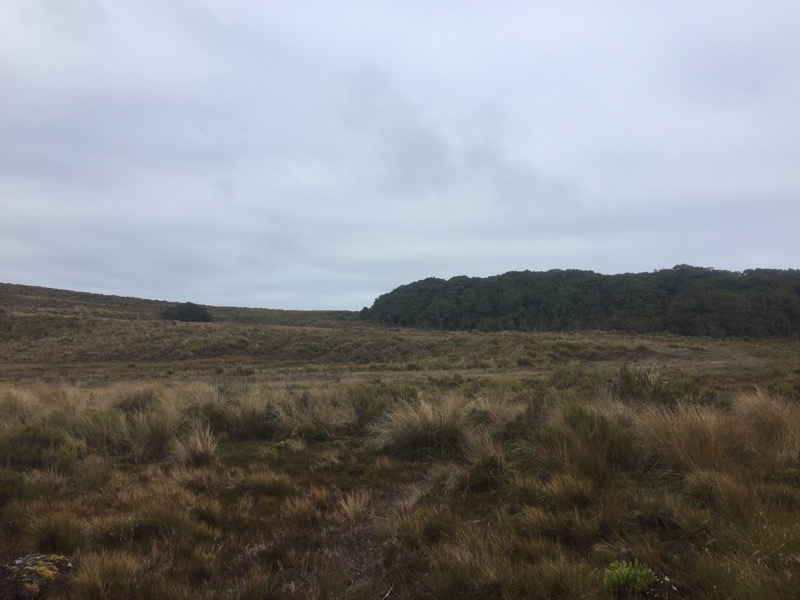 We broke out of the trees and moved through the tussock and more mud in big patches before reaching Longwood trig. The sun had cleared away some of the cloud and we could now just about see Bluff, if you squinted your eyes a bit, and Stewart Island in the distance. There it was, the end in sight. I’ve walked all the way here and I can see the end. It was an odd feeling. Mixed emotions. We hid in the tussocks, trying to shelter from the wind, and ate some lunch. Eventually it got too cold to hang around up there and we started on the descent. We were soon back in the muddy forest and I was slipping and sliding all over the place. At one point I went the wrong way and lost sight of the orange markers, I found myself at a lake of mud and had to backtrack a bit to find the trail again. I was pretty much covered in mud, I had bits on my face and clothes and on every bare bit of skin on my legs. As it dried it felt really tight. The mud didn’t let up for the next few miles, all the way down to Martins hut, which I’m glad we didn’t end up staying at because it’s a ‘historic’ hut, which translates at ‘rodent infested’. We didn’t bother to stop there as our intended camp spot was only 3.5 miles away. The trail became slightly less muddy but a little more precarious with a few obstacles in the way in the form of ditches and fallen trees. It had been a tiring day mentally, with no chance to stop concentrating, and by the final mile I was more than ready to be done for the day. I collected water from a stream and considered washing my shoes and myself in the water but, my feet were muddy but warm and the water was freezing, so I continued to just exist with the mud. Turns out that was the right decision as the trail continued to be muddy right up to the camp spot. It was a tiny camp spot next to some abandoned metal machinery, something that looked like a plough, and I’m assuming it’s leftover form the old mining days. I pitched my tent very close to Sandy and Colin and Crusher found a little space about 5 meters away. The trail started with beach and muddy forest and it’s finishing with a muddy forest and a beach.